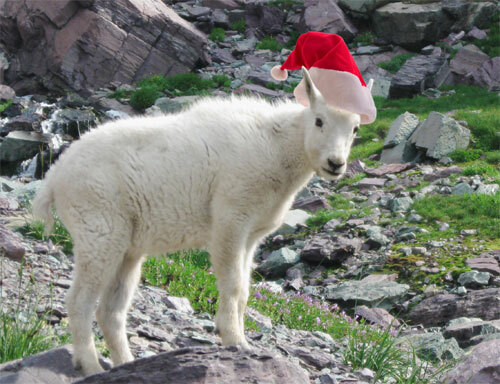 From the backcountry of Glacier National Park we want to wish you and your loved ones a Merry Christmas and a peaceful holiday season. We are out of the office for the holidays. We hope you will also have time to spend with your families and kids. We will be back in the office on Wednesday, January 2. The rates posted here on our website are now accurate and approved by the National Park Service. For those of you with reservations, your fare has changed. A new billing statement will be sent out shortly. If you have a reservation: The new deadline for submitting your deposit payment is the Christmas holiday. More specifically, 2:00 pm on December 21 is when we will close the office for the year. Please have your deposit to us by then. For those of you who have already sent us your payment information, you are all set and do not need to do anything more. You will be getting a receipt shortly. Thanks for your patience as we finalized the rates for next year. We are looking forward to meeting you in the mountains. What an amazing week we are having. It is incredible to be reminded how many people are really passionate about the chalets. We have already created hundreds of 2013 reservations and we still have hundreds more of your requests yet to handle. Thank you very much for your patience as we work to connect with you. The phone line is still incredibly busy, but connecting that way will continue to get easier with time. Our Email inbox is overflowing right now. We are several days away from answering all our correspondence. Again, thanks for your patience as you try to connect with us. You do not need to pay your deposit at this time. We are temporarily waiving the 14 day deposit deadline. With our 2013 fares not yet approved by the National Park Service, your bill is not final. We are anticipating the approval will come in the next few weeks and we will send you an updated statement at that time. You do not need to pay your deposit until you receive this bill. The mountains may be dusted with snow right now, but we can't help but get excited thinking about all the great hiking coming up next summer. We are looking forward to helping you with your chalet plans for next summer. Here are some tips to help you out. The best ways to make chalet reservations will be through this website or by telephone. From past experience we know that there will be hundreds of people trying to contact us on Monday. Be prepared for busy signals on the phone line, and be patient with any online communication. We are working hard to connect with you. There are just a lot of you to serve. We recommend using the online reservation request form. Online requests will wait in queue for us to review, so you can send it in and get on with your day. We handle all requests in the order submitted, and we will E-mail you back as soon as we can. We can also handle online requests more quickly than phoned requests, so we tend to make more reservations online than any other way. Phoning for a reservation is suggested for people with large or complicated reservations. The phone does have the advantage of a friendly voice and instant feedback on your questions. The disadvantage is that our phone line gets overwhelmed with a large volume of calls. Be prepared for busy signals and to spend some time hitting the re-dial button. The phone will be staffed from 8:00 to 2:00, Monday through Friday. We will not be able to take messages or return your call. Please do not call the Park Service or other area hotels. There is nothing they can do to help you with chalet reservations. If you are having trouble reaching us, it is because many other people are trying to contact us at the same time. Patience and persistence is the most successful strategy. Here is some information to help you plan for your 2013 visit to the chalets. Both chalets will be closing after breakfast on September 9. We will begin accepting reservations for the 2013 season on October 29. The office opens at 8:00am mountain time zone. And what a great summer it has been! I met a lot of adventurers on the trail this year and everyone had a great hiking story about a new experience, an interesting sighting, or a beautiful day. Wow. Thanks for including us in your vacation, you helped make this an incredible summer. Our offices will be closed for a while as we rest our feet and prepare for next year. Information about the 2013 season will be available here soon. A reminder for everyone planning to visit Glacier National Park in September. The last day to use the free shuttle bus along Going to the Sun Road will be September 3. After the Labor Day holiday we suggest using your own vehicle to get to the trail heads, and try to get an early start to make parking easier. The best way back to your vehicle after staying at the chalet will be to hike out on the same trail you hiked in on. Office hours are now 9:00am to 3:00pm (mountain time zone) every day until the end of our season. August is slipping past and the end of our summer season is just a few weeks away. While there is less paper for us to push around, there is still plenty of great hiking for you to enjoy. Day hikers, overnight guests, horseback riders; if your trail takes you past the chalets, we would love it if you stopped in to say hello. The Highline Trail is now open!! Please note that you may now travel the Highline Trail to Granite Park Chalet! I had a fabulous hike on Thursday, enjoying the bear grass, waterfalls, and glorious scenery! Until then, the Loop Trail is clear of snow and remains the easiest route in and out of the chalet. For the ambitious hiker, the Swiftcurrent Pass trail from Granite Park Chalet to Many Glacier is reported as clear of snow hazards and quite beautiful. We are expecting some warm weather in the upcoming week, so be prepared with extra water on your hikes and try to take advantage of the cool morning air by getting an early start. The mountains are beautiful, we can't wait to see you up here. Many happy hikers have been enjoying Granite Park Chalet this past week, and we have all been having a blast enjoying the mountains. We still have snow and wet ground conditions up around the chalet, so waterproof boots and a change of socks continue to be a good idea. Everything is melting out fast though. The Highline Trail remains closed between Logan Pass and Haystack Butte. The Loop Trail remains the best route in to Granite Park Chalet. We have no forecast for the opening of the Highline Trail. Be ready for warm hiking conditions in the upcoming week. Carry extra water on your hikes. The warm sunny days and the mountain snow make an unusual mix, so be prepared with sunscreen, hats, and sunglasses. As the snow melts out, be mindful of the new vegetation underneath. Stick to trails and durable surfaces and avoid trampling the new growth. Starting today, July 1. We will be in the office full time on our summer office schedule. You can reach us from 9:00am to 6:00pm every day until the chalets close in September. The entire length of Going to the Sun Road is now open to vehicle traffic. Opening yesterday, Tuesday June 19. If you want to drive up to Logan Pass now, be ready for road construction delays on the west side and winter conditions in the high country. There is still lots of snow in the mountains, most high country trails remain snowbound or closed. Here at the chalets we are starting to get excited about going into the mountains again soon. We can't wait to see you in the backcountry. The retail menu for this summer is now ready. If you would like to take some weight out of your pack, order in advance and we can have your food waiting at the chalet for you. Click here to get the details on our retail menu and order online. Snow in the high country is being reported as above average, but less than last year. It is still impossible to predict what conditions will be like in June or early July. Mother Nature still has a couple months of surprises for us. We will be out of the office again for the next couple weeks. Sorry for the inconvenience. If you have business with your reservation, please send us an E-mail and we will get back to you as soon as we can. We will be back in the office again after the Easter holiday on Tuesday, April 10. 2012 marks the 25th anniversary of the National Historic Landmark designation for Sperry Chalet and Granite Park Chalet. These buildings received landmark designations in 1987 as part of the Great Northern Railway Buildings which also includes The Belton Chalet, Many Glacier Hotel, and the Two Medicine Store. You can find the details of our landmark designation here. We will be out of the office for most of this week due to conferences and meetings. If you have any business with your reservation, please send us an Email and we will get back to you as soon as we can. We will be back in the office on Monday, February 20.